It is an absolute worth of your money and will not give many chances to complain. It comes with modern technical features, extra safety measures, increased comfort level and extraordinary graphics and looks. It requires some time to time maintenance and thus the users must be careful. Kayak is a mode of transportation for approaching spooked fish and is gaining exuberant popularity around the world in this recent time. It is an elite transportation and is an environment-friendly method. When we talk about kayak and fishing, Intex Challenger K1 Kayak, 1-Person Inflatable Kayak Set with Aluminium Oars and High Output Air Pump must be mentioned due to its features and benefits. It comes with modernized design and upgraded safety aspects. 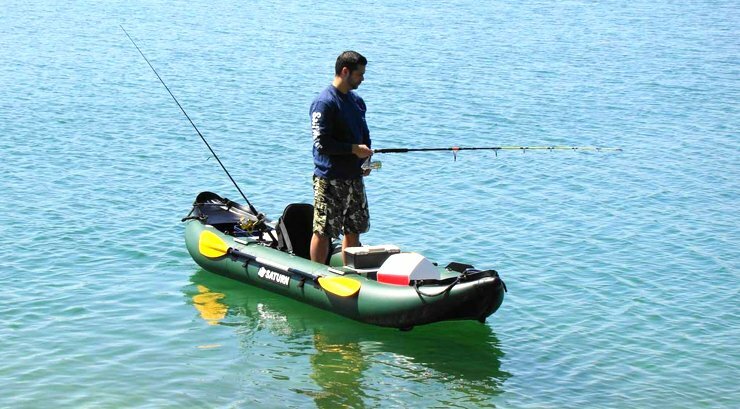 It is an inflatable kayak and it can be stored in a very small space. Because of the design, manoeuvring is excellent and easy. Anyone can carry this product easily because of the light weight structure. Reasonable cost in comparison with quality of product. The structure of this product is made of welded aluminium material and this is very enduring and nimble. Extra safety features made this product safe on the lake and on the slow-moving river. It has inflatable I-beam floor, which gives stability and comfort. The cockpit design is very unique and it provides extra comfort by maximizing the space. 84-inch oar made of aluminium is another plus point for this kayak. It also comes with high-output pumps and repair patch. The seats are also inflatable and it has a backrest. It has a cargo net for extra storage facilities. 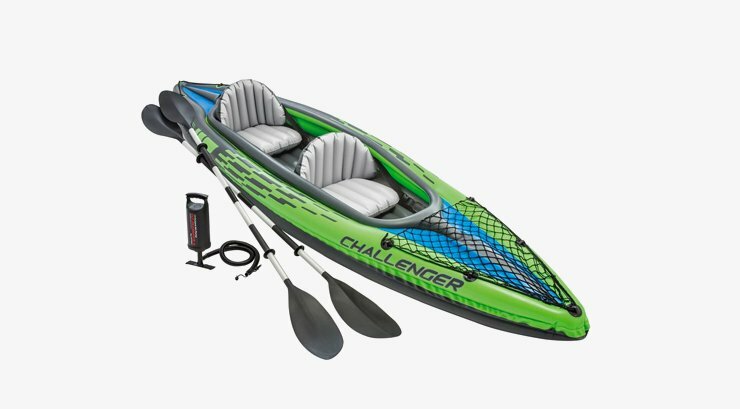 Intex Challenger K1 Kayak is long lasting and sturdy. Very easy to handle and very comfortable in carrying. It has high safety measures and safe for any lake and for slow moving river. The cockpit is very comfortable and has extra space for storage. The seat is not highly comfortable as the seat is small and the back-seat is not that useful. Sometimes hard to balance if done any sudden movement on the water. Although, after few days of practice anybody can get rid of this problem. The paddles are not adjustable with height. It comes with a user manual on the box and it is always a good idea to have a look on the manual before setting up the kayak. In the first step, unfold the kayak and the seats. Locate the Boston valves and inflate the inflatable floors first. Then inflate the outer chamber. Make sure that the kayak is inflated properly and none of the valves are open. Then locate the position where the seat goes and you will see Velcro for attaching the seats. Inflate the seats before placing it. Use the straps and buckles to adjust the seat according to your preferences. Then place the seat and attach the Velcro. Now, inflate the foot rest and place it inside at the front of the kayak. Locate the place where the skeg goes and insert the skeg and slide to the end to lock it properly. Intex Challenger K1 Kayak demands some maintenance and users of this product must maintain some hygiene factors. Always clean the kayak and dry it with a cloth after the use. You have to clean the kayak with fresh water or sometimes have to apply some soap if you were kayaking on salty water. This cleaning will get rid of any scum or other particles. If you come across any leaks then you can use the repair patches to cover the leaks. Do not inflate too much or do not inflate too less. Follow the instruction on the manuals and it will help to maintain the product quality. Always empty the kayak by opening the valves and letting the air out. Store this kayak at a dry and clean place to avoid any leakage and always keep the valves close. Fold the kayak properly and only put it inside the box if the kayak is totally dry. 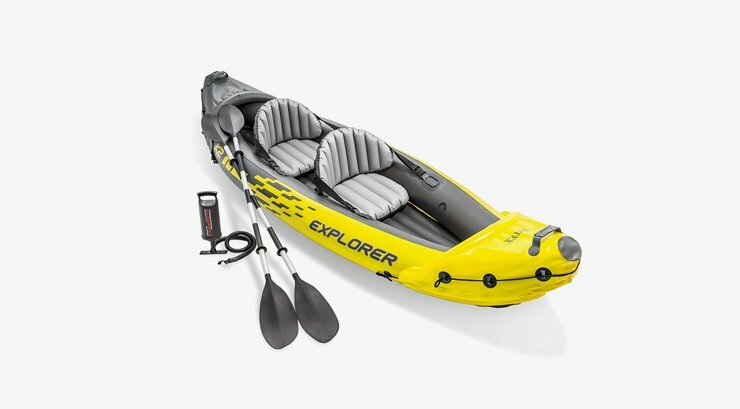 Is Intex Challenger K1 Kayak inflatable? Yes, this kayak is inflatable. Online store is the best place to buy this product as they are selling it for a very affordable price. Does this kayak inflate all together? The body of the kayak inflates together, but the foot rest and the seats inflate separately. It depends upon the area you are ordering from but in most cases you can choose the two days delivery option to get this product in two days. Are the paddles of this kayak is adjustable for different height? No, the paddles are not adjustable to height. Kayaking and fishing have a very strong relation. Intex Challenger K1 Kayak, 1-Person Inflatable Kayak Set with Aluminium Oars and High Output Air Pump is one of the best product of this kind in this price range. It comes with amazing features for the comfort and safety. 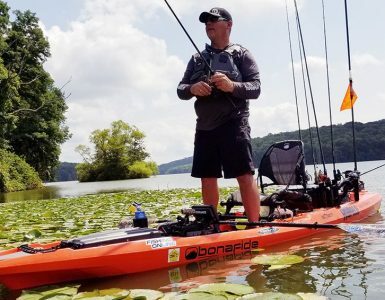 If you are planning to buy a kayak for fishing or for fun in the water, then this Kayak is highly recommended and it is worth your money.